It was an exciting afternoon, the 20th of this month, that began with a call from Mom in Louisiana. The 99 Cent Chef is on the NBC Nightly News! 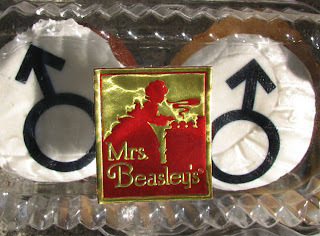 On the phone the Chef could hear his incredulous sounding sister Brenda in the background laughing in amazement. Mom was too flabbergasted to remember much and the Chef wanted a description, as the broadcast had not yet reached the West Coast -- so he got his sister on the phone, where she described the fleeting news segment: something about the Chef holding a bag of peaches, roaming the 99c only Store aisles and cooking in the kitchen. Shot only the week before, the news story was about discount food stores in a struggling economy. They needed a budget "expert" to do a "walk and talk" with a NBC producer, then return home to cook a 99 cent meal. 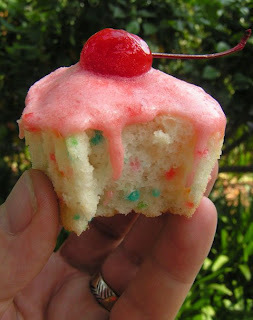 A piece of cake, and here it is. The Chef makes his entrance one minute 45 seconds into the story; don't blink or you may miss it! 99 thanks to Alexza at NBC for making it happen. Play it here. Video runs 2 minutes 8 seconds. The Chef wishes he could go to Seattle more often. A highlight from his last trip was a mushroom hunt along a mountain trail in the Cascades, east of the city. My wife's college friend Jenny, and Kevin led the way, keeping a lookout along the trail for edible fungi. We returned to their kitchen with a bag full; where they showed us the simplest and most delicious way to prepare them -- wash, dry, lightly salt and pepper then saute in butter, that's it, oh, and serve with chilled white wine. A quick saute gives you the full mushroom flavor - earthy and tender. A great appetizer or side dish. 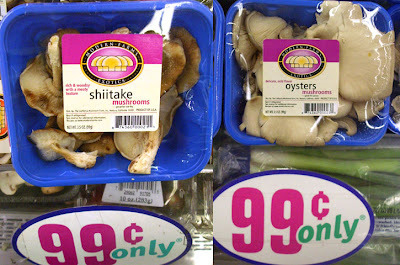 The 99 Cent Chef has been seeing fresh Shiitake, Oyster and Crimini mushrooms at 99c only Stores the last two weeks. All three varieties saute nicely in 2-4 slices of butter or a couple tablespoons of 99 cent olive oil blend, and it only takes 5-10 minutes until soft; definitely pick up a few 3.5 ounce packages along with a 99 cent bottle of Chardonnay and give it a go. 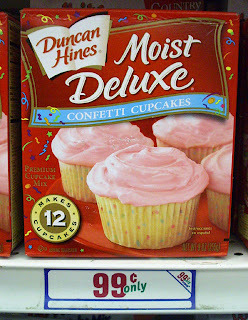 The most delicious Deal of the Day by far. Pedro Pe Meets The 99 Cent Chef ! Play it here. The video runs 1 minute 7 seconds. Click here for my neighbor Pete's hilarious videos. "The 99 Cent Chef Meets Pedro Pe" full length video is here. For a potato substitute with a tropical Latin flavor try yucca -- which The 99 Cent Chef first ran across at Versailles, LA's premier Cuban restaurant. This large waxy root cooks quickly; it looks more like a sweet potato, with a texture half way between russet and sweet potato. 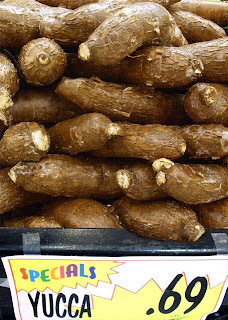 At my local Latin market, yucca is often on sale for less than 99 cents a pound and the preparation couldn't be easier: yucca is peeled, boiled for about 20 minutes, then drizzled with a Garlic Mojo Criollo Sauce -- comprised of olive oil, lime juice, garlic and sliced onion. Start your meal with a Cuban avocado /onion salad: thin sliced onion with thick slices of avocado topped with the above mentioned Garlic Mojo Criollo sauce. 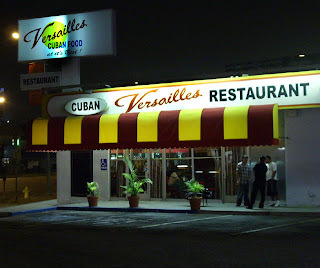 There you have it, a Cuban vegetarian meal. Peel and chop in large chunks and place yucca in pot of boiling salted water until yucca is just covered. 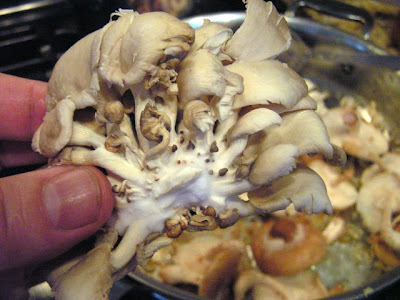 Reduce heat, cover and low boil until tender, about 20-30 minutes. 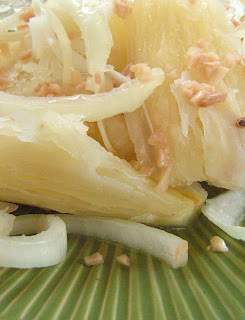 When done yucca should break apart easily; be careful not to overcook, as yucca will turn to mush. Drain and top with sliced onion and Mojo Criollo Sauce. Add chopped garlic, lemon juice and olive oil to pan, heat until bubbling. Reduce heat and add sliced onion. Mix well and pour over plated yucca. 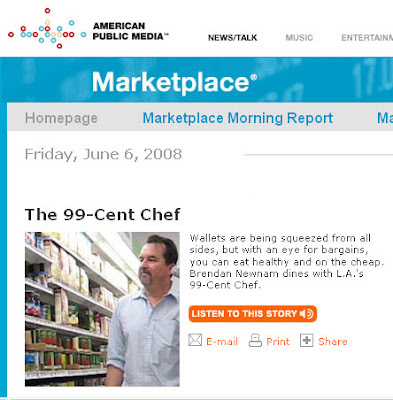 This last weekend NPR radio had a segment profiling The 99 Cent Chef on the show "Marketplace Money." Their website has the audio, photos, video and a tasty recipe called "Marketplace Pork Loin and Spinach with Mushrooms;" so if you missed it don't despair, see it all on their webpage by clicking here. Hit the play button below to watch our NPR shopping spree video. Also, Current.com, a news website, has a "Budget Recipes" report that features The 99 Cent Chef and the Hillbilly Housewife. What a combination: she is someone I am proud to be paired with. Click the play button below and watch the wacky podcast. NPR camerawork by Pete. Click here for Pete's hilarious videos. To view or embed the Chef's Current TV video from youtube click here. The mark of a good British Pub is its fish and chips -- bar food at its best, indeed. I would have preferred to shoot this video in a noisy, blurry, soccer cheering, dart throwing environment, but all that Guinness on tap would have been a debilitating distraction, so it's back into The 99 Cent Chef's kitchen. 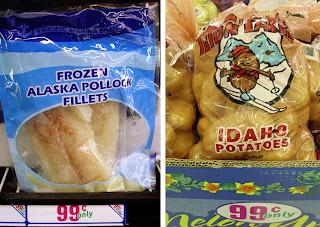 99c only Stores often carry frozen Alaskan pollock that is perfect for frying. While the fillets are not as thick and meaty as Ye Old Kings Head's fried fish fillets, they hold up quite well and are firm and flaky. I use fresh russet potatoes instead of the typical frozen packaged french fry, although frozen french fries are sold at 99c only Stores. Of special note in the video is the Chef's "double" frying method for the chips, resulting in an extra crispy skin with a fluffy center. Allow the Chef to throw his Bowler hat into the ring and give this pub fare classic a go. Give the Chef's video a butcher's hook, as his recipe is the bee's knees and quite easy peasy to prepare. Play it here. The video runs 6 minutes, 58 seconds. 3/4 (12-ounce) can of PBR (Pabst Blue Ribbon beer) or bubbly water. Heat oil to medium/high (375 degrees). Slice potatoes about finger size. Fry the chips for 2 to 3 minutes in batches if needed (fully submerge fries); they should not be crisp or fully cooked at this point. Remove the chips to a paper towel-lined platter to drain. Kick back with a PBR (Pabst Blue Ribbon) while the fries cool for 5 minutes. The fries are now ready for fry number two. Make sure oil is hot again, test out one french fry to see that the oil bubbles when a fry is added. Add half of the fries, leaving some room on top for the fish. The fries should cook a couple of minutes before you add the battered fish. Drain and kitchen towel dry defrosted pollock fish pieces. In a mixing bowl, combine the flour, baking powder, salt and pepper, a lightly beaten egg and 99 cent Pabst Blue Ribbon beer (or your favorite beer.) Whisk to a smooth pancake-like batter. 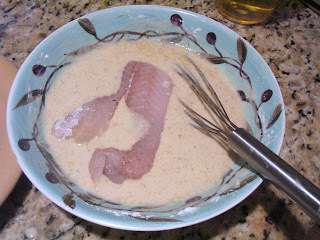 Dredge one serving of fish pieces into the batter, letting the excess drip off. 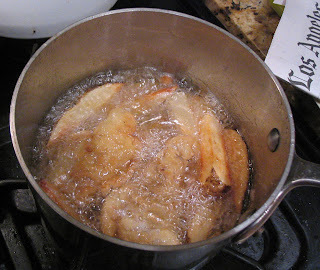 Carefully lower the battered fish on top of the frying chips. 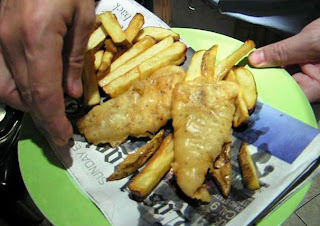 Fry the fish and chips for 4 to 5 minutes until crispy and brown. Drain and serve on your recently read local newpaper.